What a difference a year can make! The 2018 Big Turtle 50 Miler is now in the books, and it felt like a completely different event than it’s inaugural outing last year. It is hard to pinpoint from year to year what makes an event feel different, bigger, or just generally more exciting. From my perspective, as a Race Director, I see the event in a completely different light than runners. For me, the race is a culmination of more than nine months of day in/day out planning. Going into race weekend I have a very clear picture in my mind of what the race will look like. I know every turn of the course and the current trail conditions. I know what is on the music playlist. I know exactly what food will be at the finish line and at the aid stations. I know how the staging area will be staged. None of that is a surprise to me. So Brandy and I spend the entire race weekend reacting to instances where reality deviates from our plan. It’s a series of decisions made in the heat of the moment. So I don’t get to see the struggle, the smiles, and the journeys that runners see out on the trail. I want to give you a look through my eyes as the Big Turtle Race Director at what made this year’s Big Turtle event feel so special and so vastly different than the 2017 event. The first year of any event is largely trial and error. We try things out not really knowing if they will work or not. Last year we were privileged to have the opportunity to host our Friday night pre-race event at the Morehead Conference Center. Was it awesome? Yes. Was it beautiful? Yes! It raised several issues, however. On race morning runners still were not quite sure where the start line was. Many runners who attended the Friday night event in 2017 still needed directions to the start/finish line and wanted to go check it out for themselves before the race. That left us having to explain how to get there over and over Friday night! Runners getting ready for their journey on race morning. It also meant a TON of extra work for our staff. Having the Friday night event in a separate location meant that we had to unload the gear, set up for the event, host the event, tear down, pack it all up again, then take everything over to the Laughlin Building to set up for the race. We didn’t get to bed until nearly midnight on Friday night last year. This year we opted to use the gymnasium inside the Laughlin Building more. This meant that we only had to set up packet pickup once, and runners could get a good look at the start/finish line area on Friday night because they would be coming there for the pre-race meeting and dinner anyway. That also let us just leave everything set up overnight. Now, this may not mean anything to you as a runner, but it actually greatly impacts your experience on race day. Trust me when I tell you that happy, rested Race Directors makes for an overall happier and more relaxed overall event experience. The more smoothly it runs on our end, the less you notice. And the less you notice about the Race Directors the more you can focus on simply enjoying yourself! Did we ever have a stellar group of volunteers? 2017 was the first time many of our local volunteers had experienced anything as crazy as a 50 mile endurance run. It was totally foreign to them, but they were eager to help and make the 2017 event a success. This year many of our 2017 volunteers returned and they knew what to expect. They knew what to do. They knew how this whole thing works. Again, you don’t notice it; but the more the volunteers do in preparation for the event and during the event means more time for you to focus on yourself. Our volunteers stepped up big time this year by coordinating the aid station staffing, providing aid station gear, and donating their time to make sure that the aid stations and the finish line area ran smooth as butter. If you had fun at the Big Turtle in 2018 it was because of our volunteers. Let’s just address the elephant in the room. The attendance at the event this year was way more than double that of 2017. Despite the high drop out rate and tough conditions on race day in 2017, word spread about the Big Turtle and we welcomed runners to Morehead from 19 states and Canada! 270 people registered for this year’s race as opposed to 129 last year. The crowd was bigger. The energy was more electric. The races were more competitive. It was just a bigger event, and we can’t wait to see this event continue to grow. You runners showed up big time this year. You were prepared. You were excited. YOU made this event fun! We do this because we love to see you come to that finish line knowing you just did something incredible. All of our hard work is just for that moment when you cross the finish line and we get to witness that moment. Thank you for allowing us to be part of the journey. What a beautiful day on the Sheltowee Trace! Of course, we need to talk about the weather. I’ve said many times that this race is incredibly hard to prepare for. It has nothing to do with the terrain or the elevation or the distance you are running. It is that the race takes place at that weird time of year in Kentucky when winter suddenly turns into summer. We don’t get a spring here in the Bluegrass State, so what runners must do is train all winter for the Big Turtle. Then they show up on race day and have to deal with incredibly hot temperatures. That was certainly the case in 2017. This year, however, winter hung around much longer than expected. We ended up with a very mild day on race day which gave many of you the opportunity to finish. Especially you 50 Milers. That northernmost section of the 50 Mile route is a doozy any way you slice it. But to attempt a 16 mile stretch of trail with only one aid station in temperatures in the mid-80s (like many did in 2017) is a recipe for disaster. The weather gods smiled upon us this year, and it meant that over 82% of you were able to find that finish line. It has become our tradition to award one runner from every Next Opportunity event with the Unstoppable Award. The Unstoppable Award is given to one runner who we feel overcame incredible odds during their race, pushed through barriers, overcame obstacles, and exhibited an overall inspiring performance that proved them to be unstoppable. The Unstoppable Award has nothing to do with where you placed or how fast you ran. It is about recognizing the courage and strength in an individual that we felt really showed the best of themselves at that event. In addition to receiving an actual award from us, Unstoppable Award recipients also receive free entry into the following year’s race. Brandy and I typically take a few days to discuss all the various stories we saw and heard from the runners at the race and select an award recipient. This year, we were at an impasse and could simply not agree on a single Unstoppable runner. So we are recognizing two folks this year! Timbo is a friend of Next Opportunity who has run several of our races. A competitive runner, Timbo duked it out with two-time men’s Big Turtle 50 Miler champion Scott Buser several times in 2017. Timbo landed on the podium at The Reaper 30K and the Rough Trail 50K last year and had hopes of another stellar performance at the Big Turtle. 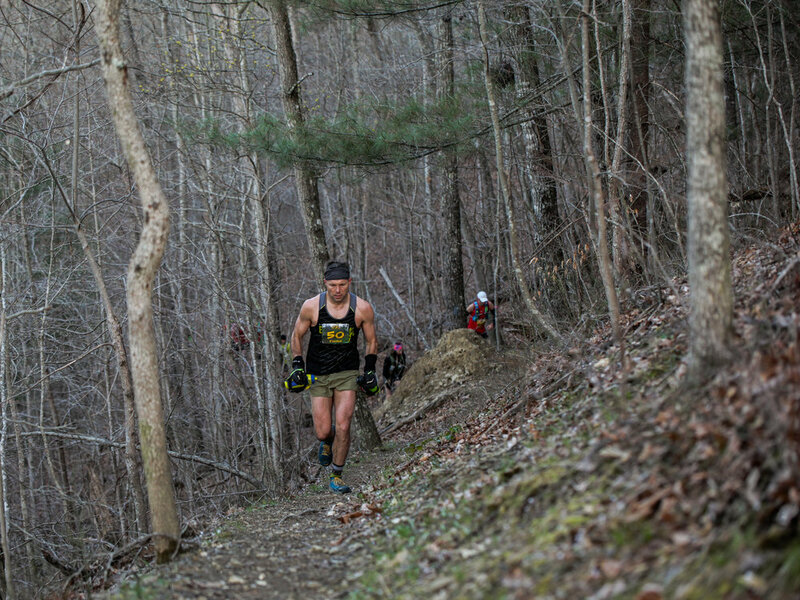 Timbo even recruited Rough Trail 50K and Land Between The Lakes 50 Miler champion Dustin Mitchell as his pacer to pull him through the last section of the course. The day, however, did not turn out the way Timbo had hoped. I will let him tell his own story, but Timbo’s race began to unravel resulting from dehydration, exhaustion, and other issues. I followed Timbo’s progression throughout the race seeing him fall back further and further from the lead as the race went on. Most competitive runners with their eyes fixed on a win will simply quit when they realize that it isn’t their day. Timbo would not. Wrecked and completely destroyed I watched Timbo struggle toward the finish line and earn that medal. No one should be upset with a top 10 finish, but we know how hard it must have been for Timbo to push through some incredible heartache and physical exhaustion to reach that moment. We are inspired by Timbo’s grit, perseverance, and unshakable positivity. Delia has been with us since the start. If you don’t know who Delia is, just looking for the lady with the giant grin at nearly all of our races, as she runs or volunteers at most all of our races. She is our biggest cheerleader and we are hers. The thing about Delia is that she doesn’t understand the meaning of the word quit. If you’ve met or ran with her, you know that already. We’ve watched her grow from a runner who chases cutoffs to a formidable force on the trail. Delia finished the Big Turtle in 14:08, narrowly missing a top ten finish, but well ahead of the cutoffs. To put this in perspective, Delia finished last year in a time of 15:28. Delia finished the race smiling as always, but exhaustion quickly took over once she crossed the finish line. She pushed herself to her limit and then extended beyond that. She had some medical needs attended to immediately after the race and is doing great! We are constantly inspired by Delia and honored to present her with the Unstoppable Award for the 2018 Big Turtle 50-miler. We’re excited to see what Delia will do at the inaugural War Hammer 100-miler!